← John 12:44-50 What Jesus Shouts! Once a year at Moody, on Maundy Thursday, the professors and staff of Moody wash the students’ feet. I have done this twice, but other years I have missed it. It starts as an embarrassment to me. It is not embarrassing because it is an act of servitude, it is embarrassing because it is an act of intimacy. I feel unworthy to have my students allow me to wash their feet. They reveal a part of themselves that is most often hidden and I wash it. After a few sets of feet, though, the embarrassment wears off and I enjoy just washing people’s feet. In ancient days, though, the issue was different. The feet were constantly exposed to the elements and the dust. The feet would be dirty and tired. The lowest servant would have the job of cleaning and refreshing the guests’ feet. Jesus takes that role and so he exemplifies servant leadership. He puts his positional power and status to one side and communicates the power of service. To serve one another, we need to see what each other need. We need to meet those needs by replacing our desires to protect ourselves and control our environment with a desire to love God and others and potentially sacrifice ourselves to serve them. Today you will probably not have a chance to wash anyone’s feet. I get to wash my children’s feet in the bath, but in general it doesn’t come up. However, holding the door open for someone, letting someone cut in in traffic, and giving up a seat on the ‘L’ are ways that we can start to put our own selves to one side. Once we are faithful in the little things the larger sacrifices might come more easily. What does Jesus do for his disciples? How has Jesus washed your feet? How will you lead the way in service of others today? Jesus does the job of the lowest servant and washes the feet of his followers. Peter at first does not want to have Christ wash his feet. However, he soon asks Christ to wash all of him- to be fully included in Christ. Jesus has washed my feet by entering into the dirtiest, messiest aspects of my story and washing them clean. He humbled himself to become man, to redeem life for all mankind, and now lives that I may life. I will lead the way in service of others by doing my roommate’s dishes without whining or asking for praise. 1) Jesus humbles Himself and washes their feet. 2) Peter did not understand, because he felt unworthy to have Jesus wash His feet. 3) Although Jesus washed Judas’ feet, He knew that Judas was going to betray Him. 4) Ultimately, Jesus has shown His humility and servant-hood through His death on the cross. 5) I hope to live a life of humility, rather than pride, and my desire is to be a servant like Jesus clearly was. First of all, I LOVE the poem inserted for the prayer. It’s the text of a song that we’ve sung in Women’s Concert Choir for the past two years at every performance; I love it! 1. Jesus washes His disciples’ feet. 2. Peter probably feels like He’s unworthy for Jesus to wash his feet, or that Jesus shouldn’t be humbling Himself in such a way. 3. Jesus washed every disciples’ feet, even Judas – what a vibrant picture of the never-ending love of God, that He would choose to humble Himself to serve the friend who would betray Him. 4. Jesus died for me! 5. Honestly, serving others for me is one of the easiest ways to obey God’s command to love your neighbor – I am detail oriented and tend to notice what needs to be done, and just do it! Today, specifically, I’m excited to spend some time one-on-one with my RA and to get a chance to encourage her. Jesus teaches by modeling, become a servant to his disciples. He is truly a radical and incredible leader. Again, John’s commentary is so interesting to me. Jesus loved His disciples to the end. He is perfectly faithful. Jesus now serves me as my High Priest, and also by bearing my burdens when I cannot. He is my Savior. One simple way I can serve others is by asking what they need and helping them. I think here at school, a common way to do this is simply listening. When someone is overwhelmed, having someone hear them out and pray with them goes a long way. 2. Peter objects because Jesus is fulfilling the role of a servant towards him and Peter thinks that, as his teacher, this is humiliating. 3. This verse proves that Jesus knew I Judas’ lack of faith all along. 4. Jesus has continually borne with me and encouraged me when I lack faith. 5. When I am with others, I want to think more about what they need than what I need from them. I love this account from Christ’s life & am drawn to serve in these types of literal, physical ways. For example, because of that, I used to really want to be a nurse & got as far as getting certified as a nurse’s aide while in high school. But visiting and working in places like (especially) Pattaya, Thailand; the Appalachia (mountain) area of eastern Kentucky (my state); Chicago; and even hospitals has made me realize though that the many issues people face go beyond the physical. For me, it is easier to just do something for someone else, but I think that God has been teaching me and challenging me to care for people in deeper ways too. Christ has “washed my feet” by providing for me physically but also in those deeper ways as He patiently helps me as I struggle (A lot. With everything. I’m a mess.) This is what this passage always reminds me of. 1. Jesus washes the feet of his disciples. 2. Peter feels that his master should not be washing his feet. 3. I think this passage highlights Judas, because Jesus still loved and served the one he knew would betray him. 4. Wow…this is something interesting to think about. I have lately felt strange about the idea of serving Jesus because of this…I realize that my acts of “servitude” are very pathetic compared to all the ways in which my Savior and Lord has loved and served me. He has washed my feet by continually pursuing me when I feel apathetic towards him. As my affections waver, his love remains constant and strong. 5. I will wash the dishes. Jesus has washed my feet by cleansing me of my sin and shame, inviting me into an intimate relationship with Him. I will serve others by authentically living my life alongside them, seeking to put their interests before my own so that they might come to experience the love and hope I have in Christ. 1. Jesus washes his disciples’ feet to demonstrate his washing of our sins and his love for us as a brother. 2. Peter does not feel worthy to be washed by Jesus, perhaps because he has some sins in his life he has deemed unforgivable. However, he still longs to be with Jesus more than anything so he let’s go and becomes clean. 3. I’m not exactly sure why. Honestly, at first when I hear Jesus calling out Judas it seems harsh and out of character. But then I remember that the devil himself is in Judas with a plan to kill God incarnate and I realize it is not inappropriate! I suppose he wants to keep his disciples informed and know the context of their salvation. 4. Jesus has washed my feet with many blessings I don’t deserve. Although I have yet to get to know my biological father and my relationship with my step dad isn’t very strong, God has surrounded me with many loving people and male role models who I can call anytime. Every time I ask for forgiveness of my sins, Jesus washes my feet and forgets them too. 5. A co-worker of mine is going through a real rough time financially and with his family. He’s my age so we can relate to each other. Today, I will encourage him with love that builds up. I’ll avoid our usual sarcastic, depressing humor and try to bring real joy to the table. I think this is one of my favorite passages of scripture. The picture of Jesus washing the disciples feet is beautiful. 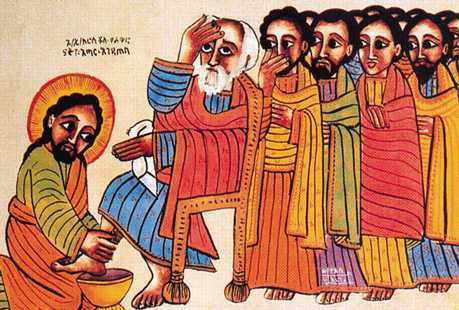 Peter does not feel worthy to have his feet washed by Jesus. I often feel like Peter, unworthy to be forgiven by Jesus. This passage of scripture was made alive to me when I had the privilege of washing the feet of orphans in Haiti. Some of the children run around all day without shoes. Their feet are calloused and dusty. I am sure they felt unworthy to have me wash their feet. I love serving others. God has given me a heart to notice when someone needs encouragement. I am at home with my mom today. She takes care of 5 kids all under the age of 3. I am hoping to encourage her today. Jesus washes His disciples’ feet. I love this event because it shows me what a loving and humble God we serve. When God has humbled Himself fully to washing dirty feet, it makes any lousy excuse to humble myself sound ridiculous. I am so glad to serve a God that loves me so much that he is willing to do the lowest thing to bring me to himself. Today I am hoping to encourage my husband. I love him so much and he is such a blessing to me and I want to bless him as well. Great example of how Christ loves us and shows us it’s not about power but love. Dignity in serving at any level with Love behind it is a good thing. I think the prayer says volumes. We must serve as often as possible. When the Spirit touches us it is easy to see where to serve but walking with God and serving in his name through Jesus summiting to Gods glory every minute of each day to walk the talk as we put it in sales is where we are trying to reach out to help others. I am comforted when I serve and forget about my problems, I leave those problems to God to show me the way if I am listening. 1. Jesus considers others better than himself, he gives for others needs and lowers himself. Jesus humbles himself and does an act that is for some of the lowest servants to do and he does it with love, and for wanting to do it. 2. Because he knows what this means, he sees Jesus and knows he is not worthy for Jesus to do this act of washing his feet. He objects and says it should be the other way around. 3. Because even though Jesus knew what Judas would do to him he still lowered himself loved him and served him. 4. He has given me far to much, things I don’t deserve he has taken me to places that i could even believe I would be. God is so loving so merciful I do not deserve anything…for I am nothing and yet he still loves me. 1) Jesus says, “What I am doing you do not understand now, but afterwards you will understand.” After what? The foot washing or his death and resurrection? Why wouldn’t they understand, unless there was a deeper spiritual meaning? This is typical Jesus speak when he refers to things the disciples will not understand until after Jesus leaves. I wonder if Jesus explains it to them, and we just don’t se that part of the conversation, because he asks later if they understand. Mt. 26:17-35 gives us some more context for the dinner conversation of this passage. 2) Jesus says, “If I do not wash you, you have no share with me.” Have no share in what? Why does Jesus have to wash them? I think Jesus is referring to his cleansing sacrifice for their sins. 3) Jesus also says, “The one who has bathed does not need to wash, except for his feet, but is completely clean.” So, if washing is indeed in reference to washing them of sin, and they are completely clean, then this must mean regularly coming to Him for forgiveness of sins committed. They do not need to be completely cleansed again for salvation because they are already in Christ, but repentance is needed for a healthy relationship with Him. 4) Jesus said, “And you are clean, but not every one of you.” (talking about Judas who was about to betray him). There is a deeper meaning here than just servitude, I believe. Jesus is using the cleanliness as a metaphor for their hearts. Why would Jesus call out that he is their Lord and Teacher, and then say the servant is not greater than his master? He is calling himself a servant and messenger of God and saying that he is not greater than the Father. Jesus then says he is about them send them out. Is the focus on an attitude of humility, mutual submission, love, forgiveness, and unity here, rather than the actual act? Since this is an example that Christ has given us to follow, and also a command, we should make it part of every day life to forgive one another, restore broken fellowship with one another, and live in unity with our fellow brothers and sisters in Christ. Something that we briefly talked about today in one of my classes and that just breaks my heart is all the division in the church, various authentic expressions of the church, which many of us are so quick to reject because their theology is wrong (at least according to us). Why can’t we get along and treat each other with love, and worship our God together? Please Lord, help us be unified in you. Help us set aside our petty differences, not at the expense of the gospel, but for it. Help us love one another as you love us. Amen. I have seen a very contrasted example of this recently in my home church. The senior pastor is extremely protective of his time, giving most of the people a sense that he is only there as a job. However, my former youth pastor shows what it means to be a servant. We hosted a concert this past weekend, and after we were all done loading out the sound/lighting equipment, people started to leave. I walked back into the sanctuary to get my backpack, and Luke (youth pastor) was on the stage vacuuming the mess that had come onto the stage during the night. This kind of leadership is not displayed enough; Jesus gives us a perfect example of this. Not one person is too good to do any specific thing. Jesus was washing his disciples’ feet, something the servant does. Luke was vacuuming the stage, something the custodians do. A couple of years ago, I heard this from Doug Fields at a Student Leadership Conference: “True leaders lead from their knees”. To be truly a good leader, you must not expect everyone else to do the things you just don’t want to do. Jesus set the example for this: don’t ask someone to do something unless you are willing to do it yourself. I believe good leadership is leading from the knees, doing even things that you don’t enjoy doing, because whatever we do for the least of these, we do unto God. I don’t think I have ever read this passage before and totally understood what Jesus was doing. No I understand. If Jesus, bring the Master, can wash his disciples feet, being the servants, then they ought to go wash other people’s feet. It’s all a matter of humility. Jesus does seem to take this time to highlight Judas as specifically not being one of these chosen disciples. Maybe because Jesus is specifically speaking to the others as disciples, as servants. Judas is not one of them and so his message of humility doesn’t even really apply to him. In this passage, Jesus washes His disciples’ feet. I believe that Peter objected to such an act of service and humility from Jesus because it was not something a leader or rabbi would usually stoop (literally) to do. Such a vulnerable, bold statement of Jesus’ servant love for His followers might make Peter uncomfortable. With the kindness and self-sacrificial nature of Jesus’ love for His disciples as the focus of this passage, I believe that Judas is mentioned for two reasons. First, to show that Jesus did not reject Judas or exclude him from the gathering of the disciples; Judas was still eating and fellowshipping with the others. Second, the mention of Judas provides for a contrast between Jesus’ love and Judas’ hate. Oh man, these questions about the nature of Jesus and His interaction with me are really challenging me to evaluate my heart on how I see Him and interact with Him. I believe that one of the ways He has washed my feet is the consistent grace in reaching down to the level at which I am operating during a given season of my life, and initiating and maintaining interaction with me. I have grown, even and especially over the last three years, in my understanding of His nature, and my relationship with Him, but throughout my whole life, and centuries beyond, He remains the same, and that is amazing and something that I will always cling to. I think leading others in service for me comes down to the attitude in which I serve. There is a line, I believe between serving in a truly humble manner, and serving with a rather huffy humility which intends to leave the served one with the feeling that they now owe you something because you have served them so gloriously and graciously. I aim for the first, the gentle, true humility that keeps no score, and expects no returns. Jesus was washing his disciples feet, but Peter objected because he felt unworthy to have Jesus washing his feet, because Jesus was greater than he. I think that highlighting how Jesus washed Judas’ feet despite knowing that Judas would betray him points to Jesus’ love for the world. Although he knows that Judas will betray him, he humbles himself and washes his feet as well. 1. Jesus humbles himself to the lowest position to serve them. Yes, that might be a straightforward answer, but if I think about it from the perspective that the King of Kings washed his disciples feet, it says so much about Christ’s character and love. 2. Peter objects because he doesn’t feel worthy. I absolutely understand this. We often don’t feel worthy to be loved, to be served. And that’s the point. We aren’t, and yet Jesus does so anyway. There is no “rank” in Christ’s eyes. Although Peter was a disciple (and therefore should have been serving, in worldly terms), Jesus served him, which would have been so countercultural. 3. Judas was mentioned to separate the one who did not have faith and wasn’t obedient to God. 4. I love this question. Ah, Jesus has surprised me so many times! He has blessed me in ways that I did not deserve or need, even just in small things. He has shown me through His Word what it means to be a servant, and I can never live up to that (of course), but I can strive to follow His example. 5. Words are free! I can encourage someone and serve them through the words I speak. 4. Jesus is giving me life even though I do not deserve it. 5. Put others in front of myself.